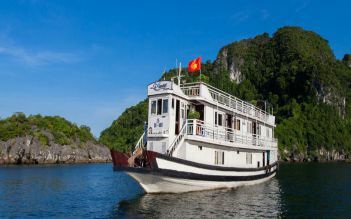 With Flamingo Cruise Halong 3 days/ 2 nights, you will visit most attractive destinations on Halong Bay such as Titop island, Pearl Farm Village,Surprise Cave…. 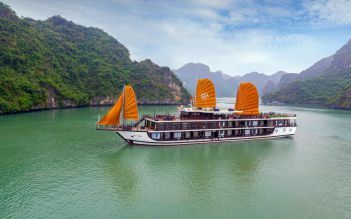 and enjoy various leisure activities in each destination: kayaking in the area of Trong Cave, participate in Vietnamese Cooking Class or relax on Sundeck to watch magical sunset and sunrise over Halong Bay. Let’s join us for a life experience. 07:30 - 08:00 Optional shuttle bus with tour guide will pick you up at your hotels in Hanoi Old Quarter area. 13:30 Great lunch is served while cruising passing by islets. 15:00 Kayaking around Pearl Farm Village, visit Titop Island. 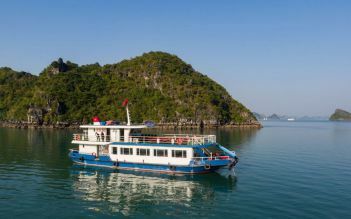 Free choice of activities such as sunbathing, swimming and conquering the peak of the biggest island in Halong and taking panoramic photos of Halong bay in the afternoon. 07:45 Arrive at the Surprising cave, the biggest cave in Halong Bay with 10,000 square meters, when you visit the cave like our Vietnamese house with three chambers as lobby, dining room and bedroom with most beautiful stalagmites and stalactites. We will tour the cave for about 60 minutes. 16:00 Arrive in Hanoi. End of the trip! Swimming or kayaking excursions may be cancelled due to poor weather. Unused services are subject to nonrefundable. In-advance register is required with name, passport, nationality, gender, and visa for all passengers. A valid passport is required upon check-in. Otherwise, boarding may be denied by port authority. We stayed on the Flamingo for 2 nights/3 days and had an amazing time. The staff were all incredibly friendly, very well organised and we were really happy with our rooms. The food was great and there was a lot of it!! Five course meals for every lunch and dinner! Lots of seafood but they were great at accommodating for those who did not eat seafood. The boat has a great mix of passengers from young to old, definitely not a party boat but filled with friendly chatty people. The drinks are expensive (to be expected) but just come prepared - bring lots of water from Hanoi and make the most of the 2 for 1 happy hour from 5pm until 11pm. The boat provides 2 free small waters each day. We would recommend staying 2 nights. 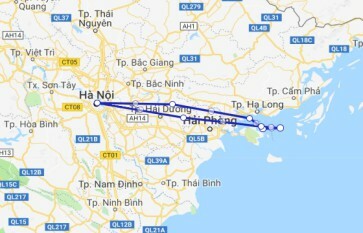 It takes 4 hours to get to Halong Bay from Hanoi (Flamingo picked us up from our hotel which was great) and staying 2 nights on Flamingo was truly relaxing. We were the only passengers who stayed 2 nights interestingly so this meant that on day 2 we went on a day boat with passengers from other boats who were also staying 2 nights. On day 2 we did more kayaking, relaxing on the day boat/absorbing the scenery and we ate more food(!). 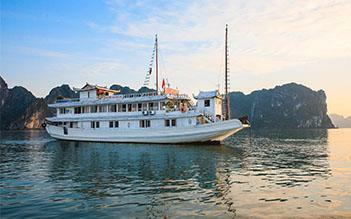 It is a relaxing day and you get to explore more of Halong bay at a peaceful pace. When we returned that late afternoon to the Flamingo boat there was a whole new batch of passengers ready to stay for one night. We didn't mind this as it meant we got to meet lots of lovely people. Flamingo - really good value for money, definitely worth staying 2 nights! Chose to tour with them out of budget considerations, ended up being really happy with our decision. The team, including our guide Johnny, was friendly and attentive. One family brought along an infant who proved to be (understandably) temperamental at times, the crew handled the situations with empathy. The age-worn ship has its own rustic charm. That the facilities weren't in tip-top order didn't bother me too much as we were only there for one night. Food was intricately prepared and suited our palates. 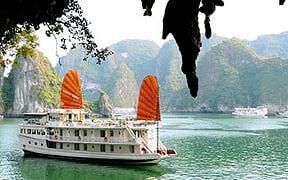 Ha Long Bay is beautiful in a subdued and peaceful way, well worth the bus journeys. 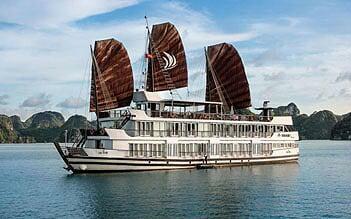 We were lucky to get the last two cabins and so set off for a two day one night trip around Ha Long Bay. Our tour guide was most energetic encouraging us to do kayaking and cooking classes etc. which are all laid on but they are also happy to let you sit back and enjoy the stunning scenery you will see from deck. Cabins were clean and comfortable, the staff and service were all great. Large range of cocktails available and the meals were a real highlight being absolutely delicious. Well worth the trip overnight. The cruise started with pick up by minibus at our Hotel in Hanoi first thing in the morning. 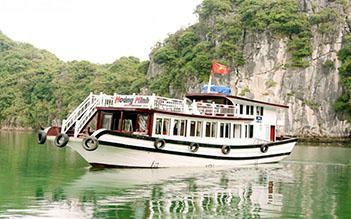 After a 4 hour journey with a short comfort break we arrived a Halong Bay. There we boarded the cruise ship: the ship was an ideal size offering accommodation for 30 passengers in comfortable, fair size cabins with ensures and ample sitting space outside on the upper deck. All the meals we had on board were a mix of Vietnamese and Western food - all very tasty. Activities on offer were kayaking on a small bay - which was lovely - though it would have been nice to have a little more time than just half an hour and the kayaks have seen better days but were adequate; a swim or hike to a view point on one of the islands - again very nice! And in the evening they offered a short introduction into the preparation of spring rolls and squid fishing for those who wanted it. On the next morning we went to visit the Surprise Cave - a huge cave worth seeing. After that the boat sailed back to the harbour. After lunch we were picked up by the minibus to go back to Hanoi. 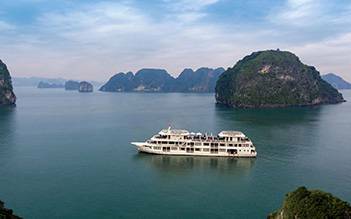 Overall Halon Bay is stunningly beautiful and well worth the visit. The day cruise was a lovely experience but be aware that it is all a bit of a rush. We opted for the 3D2N cruise on Flamingo Cruise and everything that we had experienced was fantastic. The meal was great and keep us full the whole day. The tour guide conversed well in English and gave us very nice guidance and explained history of Vietnam and Halong Bay very well. The activities were great. I enjoyed the Kayaking activity during the sunset very much. Although the squid fishing activity did not end well, we did had some fun though learning on how to catch them. The taichi and cooking class were also amazing. 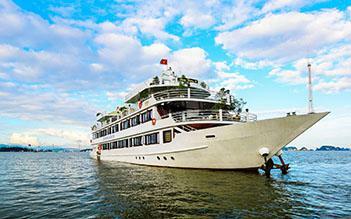 I would highly recommend this cruise as it gives value to your money and experience in Hanoi, Vietnam.